Oconoluftee River Trail, Bring the Kids, Dogs Okay Too! Oconoluftee River Trail is an easy, short, family hike along the river. It's a 1.5 mile one-way gravel trail that's level except for one small hill. This trail can be jogged without stubbing your toe! We came across some joggers while we hiked this trail. There were some dog-walkers too as this is one of the few trails in the Smokies where dogs are allowed. 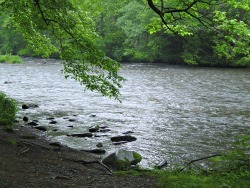 You'll see lots of places where you can access the river, so it's a great hike to bring your kids on. 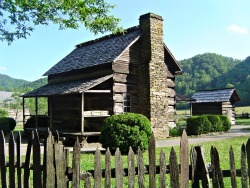 After your hike, check out the Mountain Farm Museum. Take a self-guiding tour through what a mountain farm was like in the Smokies before it became a national park. 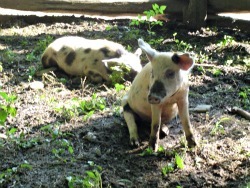 There are even real pigs there, or at least there were when we went. How to get to the trail: From the Cherokee, NC entrance, park at the Oconoluftee Visitor Center, which is on your right. There's a trail sign before the entrance to the Mountain Farm Museum.